This is one of those “just because” stories that seem to emerge from the world of motorsport, and usually during the winter. We’re not entirely certain “like a book” works the best here, but it does get the point across. How about, “Jus because we can.” That seems to be the standard MO for such monied superstars. Maybe the most interesting part was the shop modifications. This is not a bike fitted with snow machine treads. This is a bike with dozens of long metal spikes drilled into the tires. Yes, traction. Or maybe an increased potential for gruesome horror in the event of a terrible failure. Indeed. These are the things that make men proud. Showing off with machines, altering them to be able to be marginally safe while racing at top speeds on ill advised surfaces. Jaunty uniforms, video equipment, and really cool music. 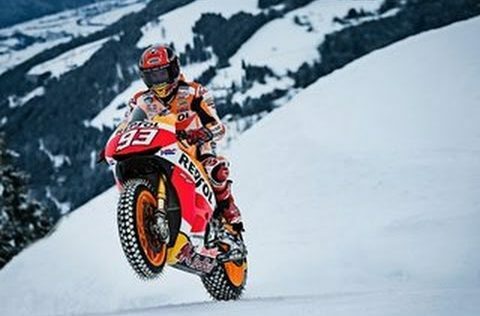 If only all of us could stud our tires with medieval spikes and then go tearing around Austrian ski slopes like lunatic monkeys loaded up on flash and energy drinks. But most of us have to work for a living, and have to keep our remarkably bad ideas to a minimum. So, you know, here’s to the other guys.